There is some unique St. John wildlife that you might just spot during your vacation stay with CimmaronStJohn! There are quite some colorful creatures, ranging from birds and marine life to reptiles. With the variety of terrain on the island, you will find these creatures at all different locations, from the beachfront to the forest to underwater. Be sure to bring your camera during your explorations so you can snap some images of these fabulous animals. Here are just a few of the unique creatures that make up St. John wildlife. The bananaquit, commonly known as the Sugar Bird, is a popular species among St. John wildlife. They have bright yellow breasts and stripes on their faces, blended with other gray feathers. These colorful birds are easy to spot and great to photograph if you can catch them in action! Put a bowl of plain white sugar on your deck and they will come! They are so beloved on St. John that there is even a store named after them in Mongoose Junction! Speaking of Mongoose Junction, another popular creature in the St. John wildlife spectrum is the mongoose! The mongoose was actually brought to the U.S. Virgin Islands in the 1800s to control rat populations on the sugar plantations. Although the venture failed (the mongoose is active in daylight and rats at night), the mongoose is credited with the demise of snakes on the island. Keep an eye out for a creature that looks like a cross between a squirrel and a weasel when you hike through the Virgin Islands National Park. You might expect to see some tropical birds and fish, but did you think you might spot some goats during your stay with CimmaronStJohn? You will find wild goats roaming across the roads and grazing on hilltops around the island. You will also find their companion sheep, who roam freely in Coral Bay. St. John goats and sheep look alike, but you can tell the difference – “tail up” = goat and “tail down” = sheep. St. John wildlife includes the white tailed deer, which was introduced to the island back in the late 1700s. These cute Bambis do very well in the U.S. Virgin Islands, swimming between the islands! You can see these creatures on the beach as well as in the ocean, though they are more commonly found in the lush forests that cover St. John. Iguanas are a staple in St. John wildlife. They are everywhere on the island! The particular species is the green iguana, but they change into various colors in chameleon fashion. These large lizards are active during daylight hours. They are vegetarians, and you can to spot them high in the trees, swimming in the ocean, or basking on sunlit rocks. Another unique animal on St. John is the donkey! These curious wild creatures are all over our laid-back island, and they sure aren’t shy about getting to know visitors. Leave a meal unattended, and some moochers will make their appearance. A product of the plantation days, donkeys are now left to roam free, becoming a classic kitschy resident. Snorkeling and scuba diving during your vacation will allow you to see some truly amazing St. John wildlife. One featured creature is the colorful parrotfish. There are many species of this magnificent fish around St. John, including the fantastic rainbow parrotfish. These fish are not only beautiful but also responsible for the fine white sand found on St. John beaches. Parrotfish break off bits of coral and rock and grind it up with their teeth, turning it into sand! A single parrotfish can produce around 200 pounds of sand every year. Fun fact! The only animal native to St. John is the bat. The bats on the island are important pollinators of several floral species and seed dispersers for fruit plants. They are also great consumers of those pesky mosquitos that you want to avoid during vacation. You should still bring your bug spray, but if you see a bat, thank them for their job of eating those awful insects! 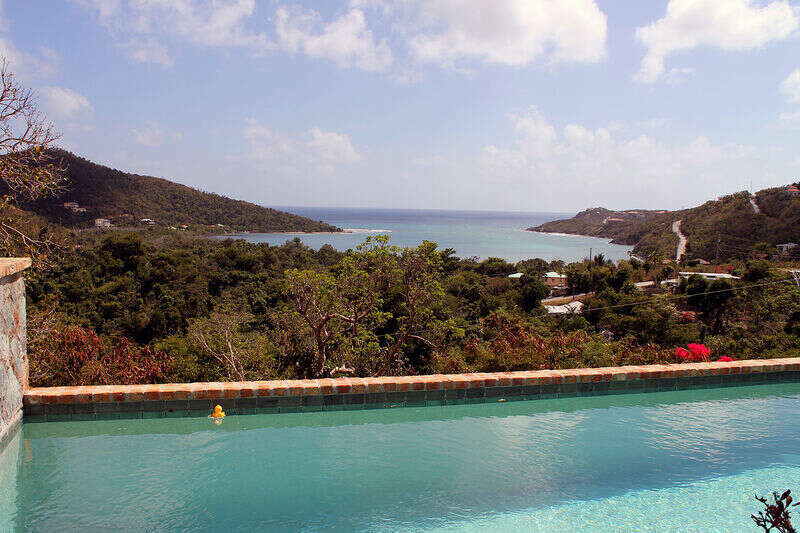 You will even enjoy St. John wildlife at your CimmaronStJohn villa. Many of these creatures are known to make a visit to houses around the island communities. Keep your eyes out for some unique St. John wildlife!